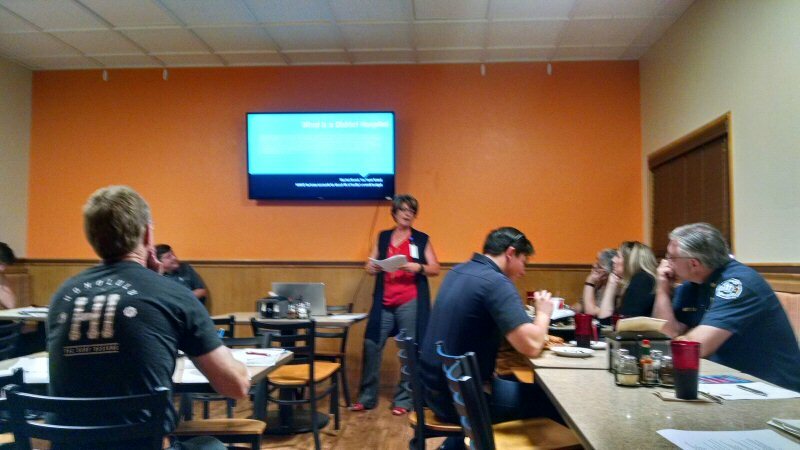 Valerie Lakey gave a talk about Mayer’s Memorial Hospital District at the Burney Chamber of Commerce meeting on Tuesday June 13, at Gepetto’s Pizza. Ms. Lakey, Director of Public Relations for Mayers Memorial, began by giving a short history of the hospital district. Mayers Memorial Hospital opened as a 10 bed facility in 1956. 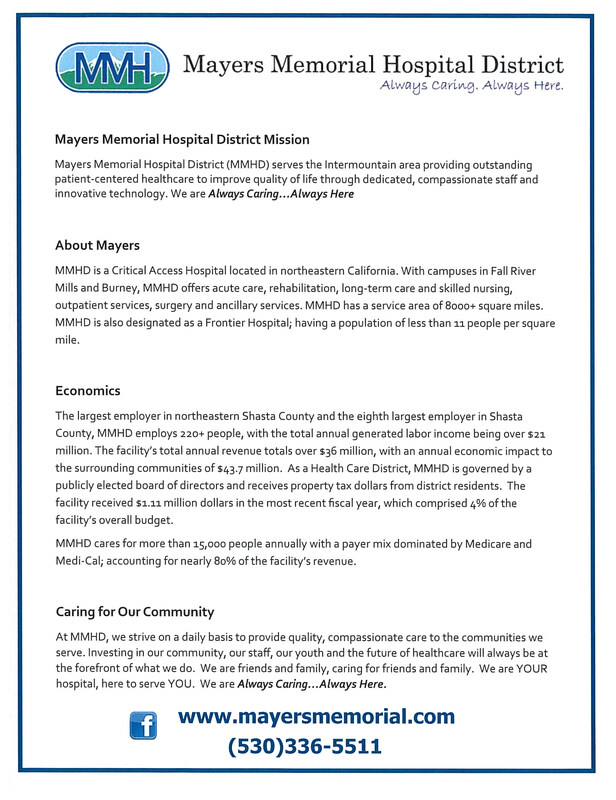 In 1969, Mayers Memorial Hospital District was established as a Special District. In 2001, the hospital was designated as a Critical Access Hospital. Since that time, the hospital has also been named a “frontier” facility by the Office of Statewide Health Planning and Development. A “frontier” area has a population density of less than 11 persons per square mile and lacks any incorporated community with a population greater than 50,000 people based on most recent federal census data. The hospital is also certified by the Association of California Healthcare Districts. The geographical area of the Special District is the same as the Fall River Joint Unified School district. The district is governed by a publicly elected board of directors and receives property tax revenue from district residents. Board meetings are open to the public. In the past year, the district received $1.11 million dollars from tax revenue. This is about 4% of the facilities overall budget. 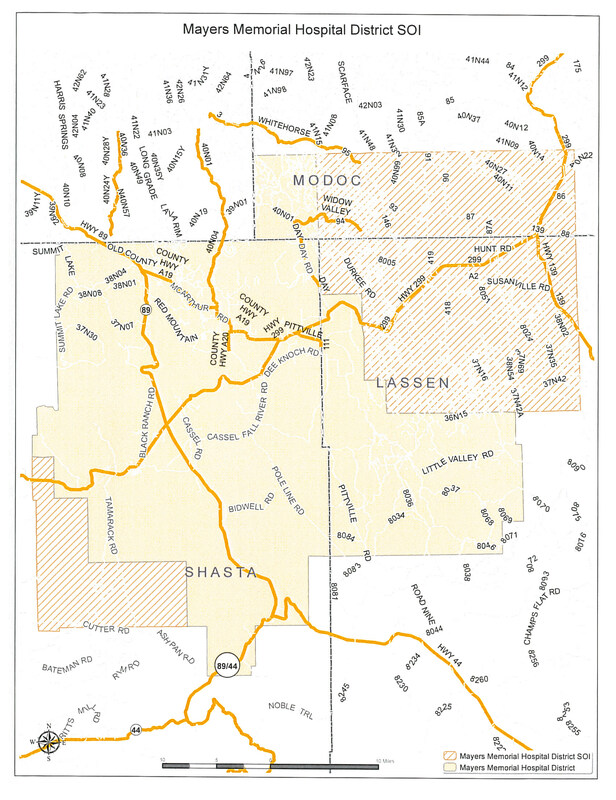 MMHD serves more that 15,000 people in an area covering much of Shasta, Modoc, and Lassen Counties. The area cared for actually extends well beyond the electoral district which provides its tax base. Ms. Lakey cited the total revenue for the hospital at $36 million. She stated that the hospital district is the largest employer in Northeastern Shasta County and the 8th largest employer in Shasta County. The hospital employs more that 220 people generating labor income of over $21 million. The annual economic impact is about $43 million. Lakey also walked the audience through the district’s website discussing the services offered and emphasizing the board and staff’s determination to provide transparency. Each month, the Chief Executive Officer, Louis Ward, provides an update on the district’s activities. She explained that while Mayers Memorial and Mountain Valley Health Centers are different entities they have a close working relationship. Also she noted that Mayers is now able to hire their own physicians due to changes in state regulations and that they hired their first physician earlier this year. Ms Lakey encouraged people to visit the hospital’s website http://www.mayersmemorial.com/ and to contact the hospital at 530-336-5511 if they have any questions.